I went back and forth between between the girly girl white furniture set and the dark espresso for our baby girl for weeks. At the end, we decided to go with the dark espresso furniture. I love the look of white furniture, it is so feminine and happy looking. However, it does seem to get dirty easier. 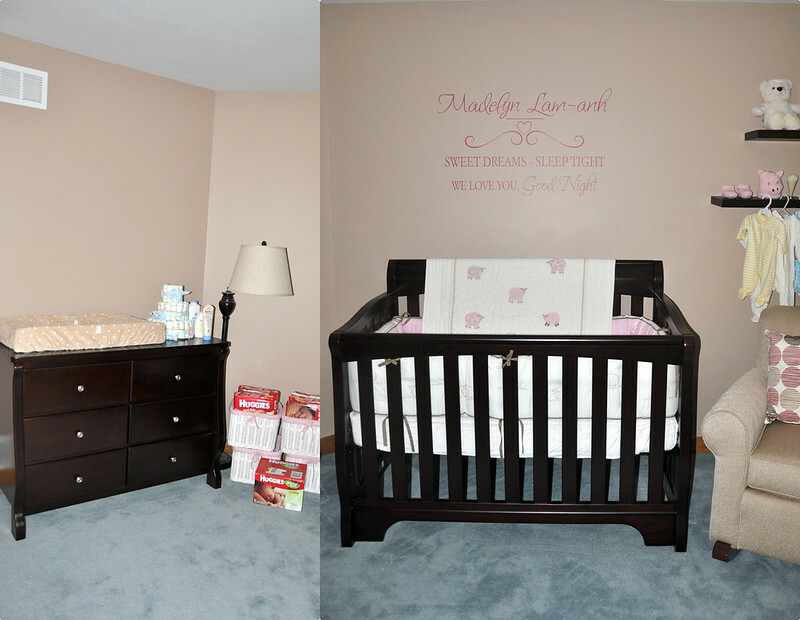 Dark furniture also gives the nursery an intimate and cozy feel. As for the dresser, we switched the original knobs for the more modern-looking ones. Replacing the dresser drawer knobs is a great and inexpensive way to give a fresh look to any room. I knew I wanted to put up some floating shelves in the nursery for decor. We saw these floating shelves at Pottery Barn and fell in love with the color. The color meshes well with the neutrality of the remainder of the room. I had fun putting my personal touch on some of the decor in the nursery. If you're looking for inspiration, Pinterest is a great source for many ideas. The original plan was to DIY the stripe curtains. However, it didn't turn out as planned because the spray paint I used was too watery for this type of project. I ran out of time and am too lazy to try again. I gave up and bought these Studio Trio Grommet curtains. I am not 100% in love with them (they are a bit too shiny for my liking). I might replace them down the road but they're OK for now. Such a beautiful nursery! I understand you don't want it too cutie. I agree with it! great room transformation! I especially like the warm tone of the walls. Beautiful nursery. I love the neutral tone with the hint of pink. Congrats on getting it all done! What a pretty nursery. We are total slackers compared to you. 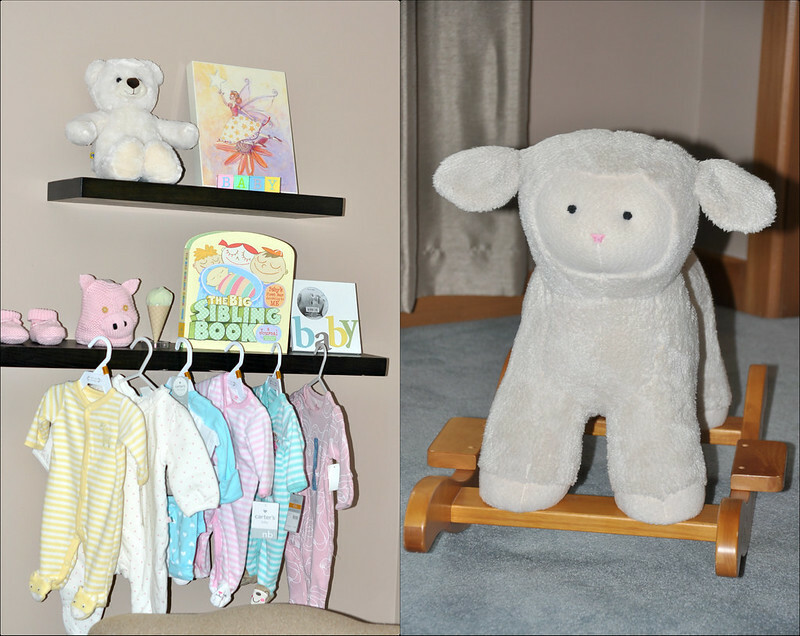 We just put the crib in our room and called it done. Great room transformation! I'm also expecting in 2 weeks time and have enjoyed reading your updates. I noticed that you've added a change mat to use on top of a dresser which I have done as well. I was thinking of using 3M velcro strips but wondered if you had any tips so that it doesn't ruin the top of the dresser when bubs grows out it, so can I ask, how did you secure the mat to the dresser? Thanks!! The nursery is lovely - I love those curtains! This is beautiful, I see how's it not overly girly it just has the right amount of cute! I love the personalized wall note! Congratulations. This has nothing to do with this post, but could you please re-upload or re-post the D.I.Y no sew clutch tutorial, the old link no longer works for some reason! Please & Thank You!! Very pretty room. I actually like the neutral colours! A lot of people go overboard with the pink or blue and it can get overwhelming. Love the cozy look, it turns out beautiful. @jodi Congrats on your new addition, Jodi! As for the changing pad, we screwed the 2 little flaps into the back of the dresser where you can't see. Check your changing pad out. It should have 2 flaps and come with 2 screws. @Lifes-A-Blog... Hi there! I am not sure what happened but everything seems to work OK on my end. I did re-upload all photos from that post. Let me know if it works for you. Very beautiful and welcoming. I love the look of that cozy chair. I love the room transition. Great job! Wow! Amazing transformation, looks GORGEOUS!! What a great transformation! I think you did a good job with keeping it simplistic yet cosy at the same time. I love this! It look perfect. So excited for you. Wow this is such a charming and beautiful space! Clear that a lot of love went into it :) Love all the details, thank you for sharing with us!